Between the cloud-scraping mountains, medieval towns and turquoise lakes, you’ll see the very best of Switzerland on this ten-day small group holiday. And not from afar, either. You’ll get the chance to catch a cogwheel train towards some of the highest peaks in Europe and sail across Lake Lucerne. The towns pack in the medieval charm. You’ll browse the library at the Abbey of St Gall, peer up at the frescoed houses of Lucerne and cycle through Bern – possibly via a craft brewery or two. In fact, this being Switzerland, there’s a foodie theme throughout the trip. You’ll see how the Gruyere factories make their namesake cheese and you'll have free time to explore the Emmental valley on foot or bike. You’ll also swing by a chocolatier who’ll show you how Swiss artisans make the best chocolate in the world. It’s a big old landscape to travel, but transport isn’t something you have to worry about. 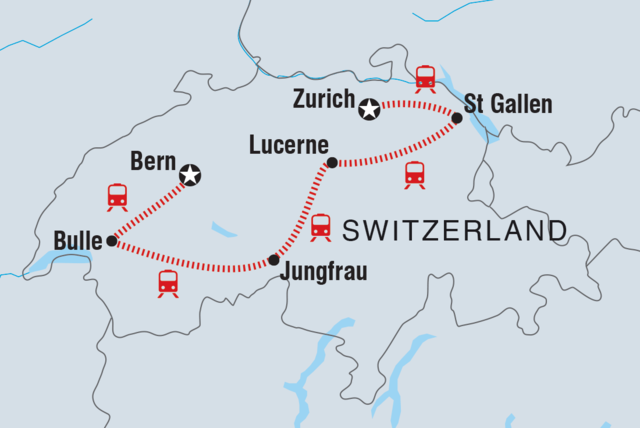 This small group holiday to Switzerland includes the train journeys and lake crossings, and tops things off with an expert guide. In every destination we visit we strive to respect the environment and the local communities as much as possible. Hence our choice to travel by train, the most environmentally friendly way of getting around. From Zurich to Bern, via Lucerne and Lauterbrunnen, we try to limit our carbon emissions and avoid the use of private transport where we can. In Switzerland, there’s not really a need for this anyway and some villages, like St Gallen, even have a traffic-free historical centre. Our hotels are always centrally located so you can get to points of interest on foot further limiting your carbon footprint. When researching your trip, you’ll probably read a lot about the purity of Swiss water. With more than 1,500 lakes Switzerland contains 6% of Europe’s stock of fresh water. We encourage our travellers to bring reusable water bottles with them and provide one to people that don’t have them. Our leaders avoid and discourage buying plastic bottles. Drinking water fountains are everywhere too, making refilling a doddle. An amazing way of exploring the country without having a huge impact on the environment is by bike. Or even better, by e-bike. Bern is the most cyclist friendly city you could ask for. Bike paths are widely available and even riding uphill becomes easy on an-e-bike. When in Bern, you will ride around the old town, visit Einstein’s house, where he developed the Theory of Relativity and enjoy a picnic with your fellow travellers. Our approach to local communities can be seen in some of the activities chosen for the itinerary: the visit to St Gallen library, for example. The entire Abbey precinct was declared a UNESCO World Heritage Site in 1983, and the Abbey Library hosts a collection of medieval texts and important documents dating back to the 8th Century. The income from the visits goes to the communities. Many travellers don’t know about the existence of this precious piece of history of mankind.